Between school supplies, new clothes and the latest gadgets, the back to school list is never ending. One overlooked back to school necessity is everyday wellness, keeping kids feeling their best so they can perform their best. New lozenge in lollipop format in kid-friendly flavours, for ages 4 and up. The fruit-flavoured pops are available in two varieties and three kid-friendly flavors. 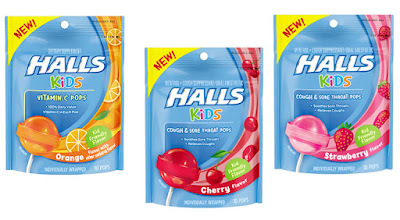 HALLS KIDS (10 pops per package at MRSP $4.99) Cough & Sore Throat Pops available in Cherry and Strawberry flavours and HALLS KIDS Vitamin C Pops in Orange. HALLS KIDS Pops are a new product that parents can feel good about giving their little ones. Each pop contains 5 mg of menthol, an active ingredient that temporarily relieves cough, sore throat and nasal congestion. FIRST kids cough lozenge in pop format with menthol as the active ingredient. Each pop contains 60 mg of Vitamin C, an essential vitamin for children ages 4 and up. FIRST nationally available Vitamin C Supplement Pop in the pediatric set. HALLS KIDS are available just in time for the busy school year at the following retailers London Drugs, Shoppers and Rexall. Contest: We want to get you ready for Back-to-School. Win a HALL Kids Prize Package. Enter to win at www.urbanbaby.ca/category/contests. Good Luck!